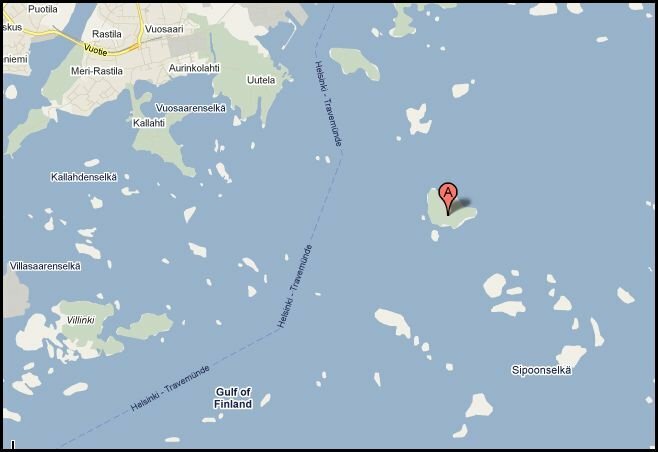 - First, at a distance of about 750-1000 m out on the bay (Aurinkolahti), in the direction of Musta Hevonen island, a luminous object suddenly appeared over the horizon. Its shape was that of a parallelepiped, comprising two rhombic and four rectangular surfaces. It shone emerald-green, though with a darker turquoise hue around the edges. This first object was some 40 meters wide across its front face and was stationary for about 30 seconds, hovering at a height of 25-40 m.
- From this object "emerged" a number of smaller, shining objects in the shape of cones. These were initially bright yellow, but quickly shifted to orange, then to a brilliant white, then bright yellow again. The cones were about 5 m tall and about 1,5-2 m in diameter at the base. They, too, were 25-40 m above the sea, but were moving around rapidly, and the color cycling occurred at a rate of tenths of seconds. We saw them go through about 20-30 such cycles (10 secs). - These smaller objects then merged back into the larger one. While this was happening the aggregate object showed several different hues. - After this the object simply disappeared, although my wife spotted a dark, semi-transparent cloud next to the original location (dark enough to stand out against the night sky), drifting ENE towards Pikku Niinisaari isle. - Finally, we saw another luminous object in the shape of a cone some 40 m tall, hovering at a height of about 20 m over the Uutela promonitory at the bay inlet. It was orange in color, but had other bright hues around the circular base edge. This object was visible for up to 40 seconds. Eventually it vanished completely, while still above the headland. - We stayed to watch the sea for another half-hour, but there was nothing more to be seen. I reported the incident to the Coast Guard, where it was duly recorded. Friends have suggested it might have been some kind of military drill by the garrison stationed out on Isosaari island, involving signal flares and a weather balloon. I hardly think so, for several reasons. No such drill appears to have been in progress at the time; a balloon, to my knowledge, cannot behave as described, etc. Another possible explanation, at least in theory, would be ball lightning. I don't buy this either, since ball lightning in winter is exceedingly rare. A third conjecture offered is that it was the lanterns of a large freighter passing in the dark. This too is out of the question, considering the shape and number of the lights, their movements and rapid color cycling, etc. Also, I'm somewhat familiar with maritime traffic in the area, since I live right by the sea, not far from Vuosaari harbor. In fine, I can find no rational explanation for the phenomenon. I hardly drink at all, certainly not on weekdays, and wasn't tired. During my service in the armed forces I was never one of those who thought they saw "something moving" every time they were on guard duty. My wife's mental makeup is similar. In addition, visibility at sea was relatively good.